This optical illusion carpet spotted in a Paris video game store provides an illusion of a vortex floor. The effect is achieved by printing bent lines in a chaotic manner just like what we have already seen in Apple’s executive garden. 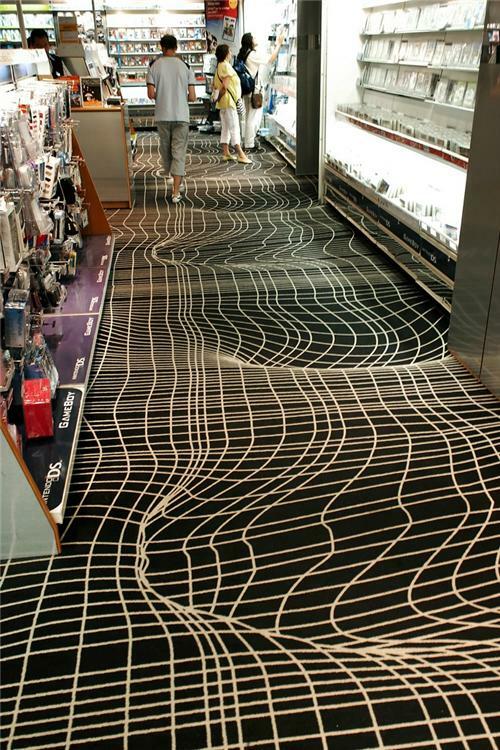 Not only does this carpet mess with your mind, it might also make you actually trip while trying to walk across it! If you see the woman spinning to the right you are using the right side of your brain. If she spins to the left you are using the left side of your brain. Practice seeing if you can use both sides of your brain to make her spin both directions. Practice makes perfect. With Monday being a holiday this week is going even faster! Soon the weekend will be upon us again, it’s already Thursday! Hope your week has been great! It really works, try it! It's a trick. The dots at the edges of the GIF are already moving faster than the center. If you block the center with your fist, all you see are the outer dots which are already moving faster making you think they are moving faster with your fist there. Pretty cool, huh? Wooooooooooo, closest thing to feeling drunk without touching a drop, good fun Beckie. Interesting eh, if only they could come up with sustainable employment for all...imagine the possibilities! pop on by, pull a chair up and get your read on.